SEEN/UNSEEN unites two bodies of work by Gerri Rachins in her first New York exhibition at The Painting Center. The SEEN part of the show, in the Main Gallery, features six paintings from Rachins’ recent POPROCK series. The UNSEEN portion, in the Project Room, features six paintings on panels, titled M80s. They are rooted in work the artist began in the late 1970's, recently rediscovered, and reworked with a blowtorch. Though distinctive in form and mood, the two series reflect the artist’s fascination with the natural world and how we perceive it. They also show her flaunting art-historical tradition, playing with the boundaries between painting and collage, using materials unexpectedly, and infusing her work with her a sense of alchemy. The POPROCK paintings were inspired by bright bits of colors in the sand that Rachins observed while walking on a Miami Beach. 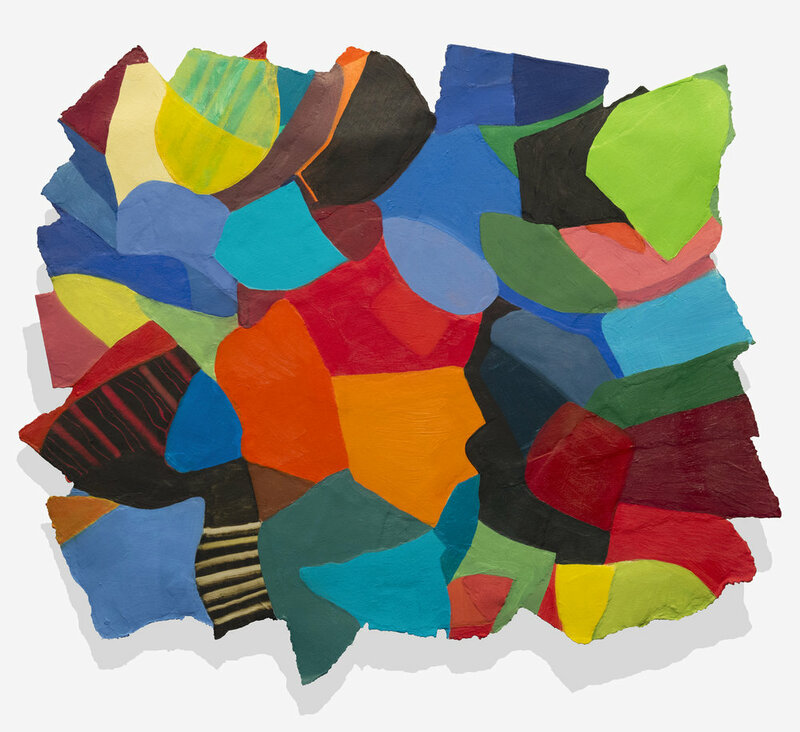 Back in her studio, she kept the colorful pieces on a tray, playing occasionally with their shapes and color relationships. Their distinctive palette, faded by their ocean immersion, reappears in the POPROCK paintings, re-energized by the artist as fully saturated color. Underneath her vibrant layers of oil paint, cut and torn pieces of heavy white drawing paper cover a rectangular panel. Its original shape is almost entirely obscured. The finished works tease the eye and cause the viewers to question their own perception. Though they appear to be two-dimensional, they project from the wall. Often, tightly layered colors seem to change position. At times the paintings appear to be flat two-dimensional collages, their edges defying art-historical tradition by breaking through the rectangle. The UNSEEN part of the exhibition, features six paintings on panels, titled M80s. They are rooted in work the artist began in the late 1970s, recently rediscovered, and reworked with a blowtorch. These works were inspired by Rachins’ interest in astronomy: particularly the globular cluster referred to by NASA as an M80 or Messier 80. Her inability to see the cluster in the night sky provoked her reflections on human vision—understanding what we see and what we cannot see. She has long been preoccupied by the distinction between night and day vision, a subject she explores with her art students in the School of the Museum of Fine Arts at Tufts in Boston. Aspiring toward particular tones of silver gray seen in the night sky, Rachins heated paraffin wax, adding many silver crayons to the mix. She poured the wax onto the panels, and then submerged small collages made of paper ripped and torn from earlier work. “The weight of the collages caused the wax to drip down the sides of the panel. I think of the drips as evidence of gravity manifest,” the artist says. When the wax cooled, she covered the entire front of the painting with dark graphite powder. Later, she altered each painting’s surface using a blowtorch. Gerri Rachins has been a faculty member for over 16 years at the School of The Museum of Fine Arts at Tufts and also taught at Massachusetts College of Art & Design for 13 years. Rachins received a Master of Fine Arts from Massachusetts College of Art and Design, a Bachelor of Fine Arts from University of the Arts in Philadelphia, PA, and also studied at The New York Studio School. Rachins’ artworks, are part of private and public collections, including the Museum of Fine Arts, Boston, the Danforth Art Museum, Fidelity Investments Corporate Art Collection and others throughout the United States. Her paintings, drawings, and mixed-media collages are represented in the Boston area by Mobilia Gallery in Cambridge, MA.